There are many variations of Kashaya - below are two very simple and easy to prepare recipes for everyday use - that require only two of the main spices - cumin & coriander. The first is a Kashaya powder and the second a simple tea using the whole seeds. Coriander (Coriandrum sativum) is one of the best herbs for supporting healthy digestion. Bitter, pungent and sweet in taste. It evokes the digestive fire while simultaneously cooling and soothing. Tonifies, increases absorption, improves digestive enzymes, reduces nausea and blood pressure. It removes excess heat in the body making it useful in cooling pitta-related imbalances associated with menopause. It also supports proper function of the kidneys and healthy urination. 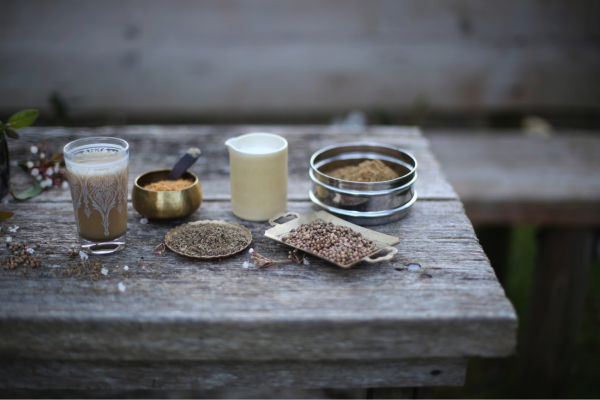 The seeds combine well with Cumin to make an excellent digestive tea. Cumin (Cuminum cyminum) is one of the best herbs for supporting healthy digestion. Bitter, Pungent & Astringent. It is carminative, aromatic, and on the whole cool in action. A common household spice, its Sanskrit name literally means 'promoting digestion'. In addition to providing flavor to food, cumin evokes the digestive fire, promotes healthy absorption and eliminates natural toxins. It is useful to the eyes, beneficial to the heart and strengthens the uterus. It is an appetite stimulant and aids in digestion. Enhances immunity and invokes good sleep. Makes 1 cup Kashaya Powder. On a low flame, heat a medium skillet until it is hot to touch, dry roast the cumin seeds until their colour deepens and a noticeable smell appears. Seeds may start popping by that point. Be careful not to burn the spices as they can ruin the taste of the kashaya. Set aside to cool. Place the coriander seeds into the skillet and repeat the process. In a powerful blender/coffee grinder, grind the toasted cumins seeds to a very fine powder. Pour into a bowl, and set aside. Repeat with the toasted coriander seeds, these may take longer to grind. Pour into the bowl with the ground cumin, combine well and store in an airtight container. To preserve the medicinal qualities of the spices it is recommended to make fresh every 10 - 14 days. In a small pot, pour in ¾ cup water and bring to boiling point. Add the Kashaya powder, and sugar. Allow to simmer for a few minutes. Turn off the heat, add the milk, stir & pour into a cup, (no need to strain as drinking the layer of powder which collects at the bottom is beneficial for the medicinal properties). Set aside to cool until moderately warm. Enjoy. In a small pot, pour in 1 cup of water and bring to boiling point. Add the whole coriander & cumin seeds, and sugar. Allow to simmer for a few minutes. Turn off the heat, add the milk (if using) and strain the Kashaya. Set aside to cool until moderately warm.